Typically, when creating content in enPortal it is recommended that it be added into a new folder under the Directory/deployment/Menu folder so that it is accessible to everyone, as seen with the green arrow in the screenshot below. 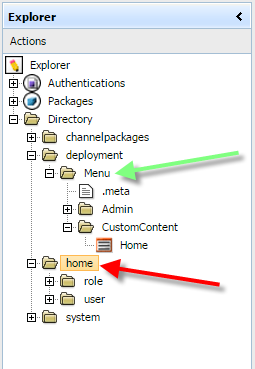 To create a new folder, just right-click on Menu and select 'New Subfolder' to create the custom folder. You can name it whatever you wish, and in this example it was named 'CustomContent'.